(Nanowerk News) On the plains of Namibia, millions of tiny termites are building a mound of soil—an 8-foot-tall "lung" for their underground nest. During a year of construction, many termites will live and die, wind and rain will erode the structure, and yet the colony's life-sustaining project will continue. Inspired by the termites' resilience and collective intelligence, a team of computer scientists and engineers at the Harvard School of Engineering and Applied Sciences (SEAS) and the Wyss Institute for Biologically Inspired Engineering at Harvard University has created an autonomous robotic construction crew. The system needs no supervisor, no eye in the sky, and no communication: just simple robots—any number of robots—that cooperate by modifying their environment. Harvard's TERMES system demonstrates that collective systems of robots can build complex, three-dimensional structures without the need for any central command or prescribed roles. The results of the four-year project were presented this week at the AAAS 2014 Annual Meeting and published in the February 14 issue of Science ("Designing Collective Behavior in a Termite-Inspired Robot Construction Team"). The TERMES robots, developed at Harvard, act independently but collectively. "The key inspiration we took from termites is the idea that you can do something really complicated as a group, without a supervisor, and secondly that you can do it without everybody discussing explicitly what's going on, but just by modifying the environment," says principal investigator Radhika Nagpal, Fred Kavli Professor of Computer Science at Harvard SEAS. She is also a core faculty member at the Wyss Institute, where she co-leads the Bioinspired Robotics platform. "We try to draw inspiration from the elegant ways in which Nature self organizes and self regulates," said Wyss Institute Founding Director Don Ingber, Ph.D., M.D., "and this latest feat by our robotics team is clear evidence of the tremendous potential of bioinspired engineering, and its ability to spawn truly game-changing technologies." "Normally, at the beginning, you have a blueprint and a detailed plan of how to execute it, and the foreman goes out and directs his crew, supervising them as they do it," he says. "In insect colonies, it's not as if the queen is giving them all individual instructions. Each termite doesn't know what the others are doing or what the current overall state of the mound is." Instead, termites rely on a concept known as stigmergy, a kind of implicit communication: they observe each others' changes to the environment and act accordingly. That is what Nagpal's team has designed the robots to do, with impressive results. 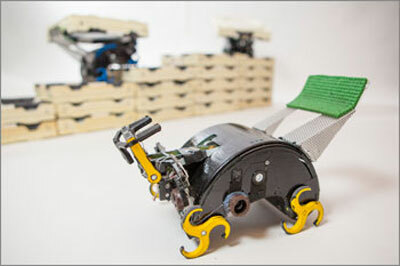 Supplementary videos published with the Science paper show the robots cooperating to build several kinds of structures and even recovering from unexpected changes to the structures during construction. Watch a video of the robots in action. Nagpal's Self-Organizing Systems Research Group specializes in distributed algorithms that allow very large groups of robots to act as a colony. Close connections between Harvard's computer scientists, electrical engineers, and biologists are key to her team's success. They created a swarm of friendly Kilobots a few years ago and are contributing artificial intelligence expertise to the ongoing RoboBees project, in collaboration with Harvard faculty members Robert J. Wood and Gu-Yeon Wei. "When many agents get together—whether they're termites, bees, or robots—often some interesting, higher-level behavior emerges that you wouldn't predict from looking at the components by themselves," says Werfel. "Broadly speaking, we're interested in connecting what happens at the low level, with individual agent rules, to these emergent outcomes." "We co-designed robots and bricks in an effort to make the system as minimalist and reliable as possible," Petersen says. "Not only does this help to make the system more robust; it also greatly simplifies the amount of computing required of the onboard processor. The idea is not just to reduce the number of small-scale errors, but more so to detect and correct them before they propagate into errors that can be fatal to the entire system." In contrast to the TERMES system, it is currently more common for robotic systems to depend on a central controller. These systems typically rely on an "eye in the sky" that can see the whole process or on all of the robots being able to talk to each other frequently. These approaches can improve group efficiency and help the system recover from problems quickly, but as the numbers of robots and the size of their territory increase, these systems become harder to operate. In dangerous or remote environments, a central controller presents a single failure point that could bring down the whole system. "It may be that in the end you want something in between the centralized and the decentralized system—but we've proven the extreme end of the scale: that it could be just like the termites," says Nagpal. "And from the termites' point of view, it's working out great."